Contents note: Sky fire / Juliana -- The moment / Indivinity -- Angelus cantus / Pia -- Woman wisdom / Juliana -- World of wonders / Cora O'Donovan -- Flaming star / Sally Oldfield -- Musa mare lullaby / Wendy Stark -- Free yourself / Susanna -- Fly through the skies / Sarah Jones -- Honour the Earth as your mother / Sarah Hopkins -- Canzone angelica / Sharon Sage -- Waterfall / Tribe -- De profundis / Imogen Moore -- Shyam / Pia. "Bonus Australian edition" -- Container. Performers: Korowa Anglican Girls' School (Hopkins). Score: Honour the earth as your mother : for SA/SATB choir with orchestra / Sarah Hopkins. 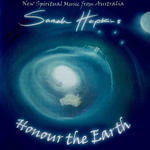 CD: Honour the earth / Sarah Hopkins. CD: Music for the journey home : as heard on Classic Drive.